NEW YORK — Jan. 15, 2019 — Knewton, the world’s leader in AI-driven teaching and learning, today launched altapass, an all-access pricing offer for alta, the company’s adaptive learning courseware for U.S. higher education. 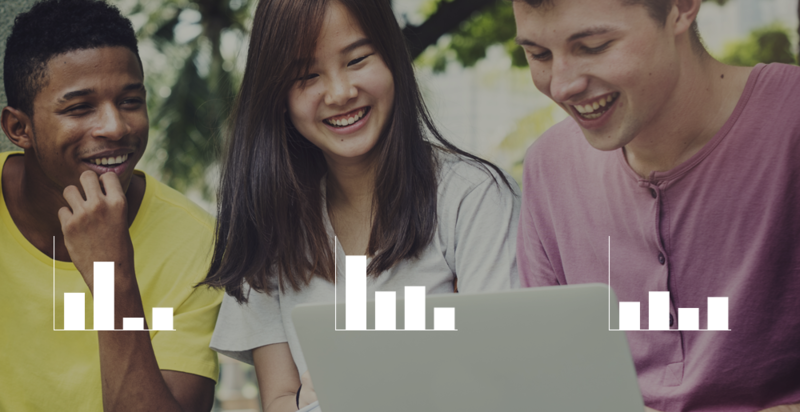 With altapass, students can access multiple alta products across a single subject area for up to two years, and for unlimited use, for $79.95. Additionally, Knewton has reduced the price of a single-course alta subscription from $44 to $39.95. Knewton’s effort to make alta more accessible and affordable comes one year after the product’s successful introduction in the U.S. higher education market. Launched in January 2018, alta was used by instructors at more than 250 colleges and universities during the Fall 2018 term. Students who begin alta assignments go on to complete them. 88% of the time, students who attempted an assignment actually completed it. This rate has remained consistently high over time: during alta’s 2017 beta release, students completed their assignments 87% of the time. Alta is associated with higher test scores. Students who completed alta assignments performed 22% better on tests. Of students completing alta assignments, those who used alta’s AI-driven Review Center to prepare for an exam performed 9% better on tests. Knewton recently published the results of an independent study of alta’s effectiveness led by the Center for Research and Reform in Education at Johns Hopkins University. The study’s findings drew a link between alta and improved student performance across student ability levels, classrooms and institutions. Earlier this year, Knewton presented an efficacy analysis of alta, Knewton’s adaptive learning courseware for higher education, developed by our data science team. From our perspective, the results of our internal analysis strongly suggested a causal link between alta and improved student performance. Because even the best-intentioned researchers can introduce unconscious biases when making analytical choices, we knew that our in-house analysis could only be part of the story of alta’s effectiveness. As a data science team comprised largely of academics, we have a deep appreciation for the value of independent reproduction of scientific results. To get a fresh, unbiased perspective on alta’s impact, we shared our fully anonymized Fall 2017 data with the Center for Research and Reform in Education at Johns Hopkins University (JHU). More specifically, we asked JHU to assess the impact of demonstrating concept proficiency by completing alta assignments — as well as alta usage in general — on student outcomes like quiz and test scores, future assignment completion and retention. To gain an understanding of the study’s key findings and conclusions, we invite you to read JHU’s complete analysis of alta’s impact on learning outcomes. These analyses — performed by different teams, in different ways, and across different time periods — represent both a fundamental piece of scientific research and are key to our efforts toward transparency and continuous, data-driven improvement. Now, the conversation around alta’s impact must expand to include things like direct feedback from instructors, student surveys, user research, and case studies from a variety of classroom settings. There’s a lot of work to be done! While conducting a conversation that, by design, never ends is in some ways daunting, it keeps us connected to the experiences and results of our users. And from that perspective alone, this endeavor has been a valuable one. Machine learning, AI and other algorithmic technologies have long promised to enhance the learning experience for college instructors and students. But what can these technologies actually deliver? What’s required to implement them effectively? And how can they operate in a way that’s both equitable and transparent? Andrew Jones, a data scientist here at Knewton, joined a panel discussion hosted by EdSurge this week in NYC that sought to answer some of these questions. The panel, which included a group of educators and education technologists, covered a range of issues, including how machine learning technologies are perceived by students, specific areas where machine learning can make an impact on learning, and the barriers that must be overcome for this technology to be implemented successfully. When asked to suggest the tough questions that instructors should ask before implementing machine learning technologies in their classroom, Andrew urged instructors to push for greater transparency into how a company’s algorithms work. “Asking what is being optimized for, and why, can give you a sense of [whether a tool] is focused on student outcomes, or whether it is about getting a prediction that’s right more often,” he said. You can find a full recap of the event over on EdSurge. As back-to-school season approaches, Knewton is diligently working on powerful new feature releases and product updates. 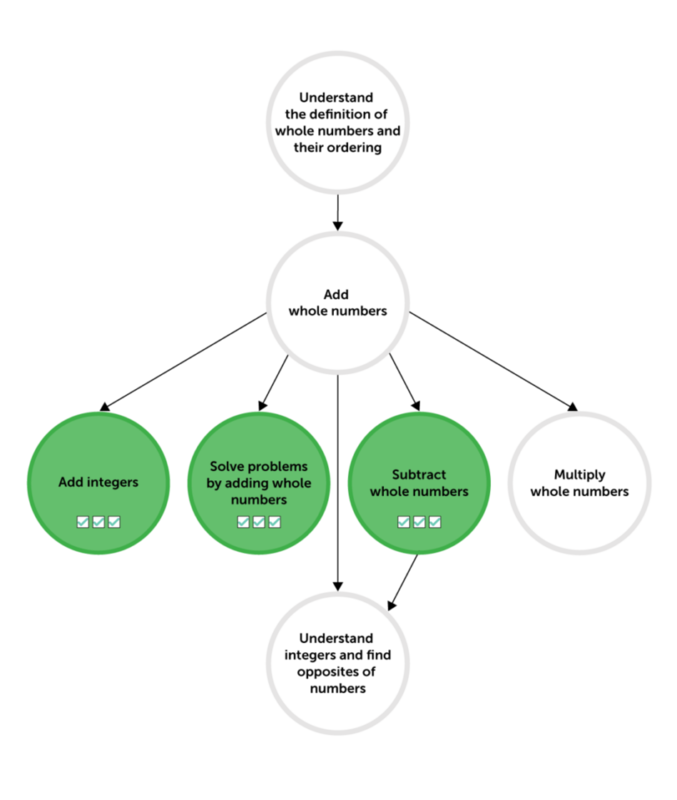 And Knewton’s User Experience Research (UXR) practice supports this work by incorporating instructor and student feedback through a host of research methods. We vet draft experiences with users, identify issues, iterate, and validate potential solutions. And this is all often before a single line of code is written for a new feature release or product update. Knewton UXR recently conducted efforts to inform an upcoming alta feature that allows course coordinators to create and manage multi-section courses. We wanted to first understand educators’ current practice, and then swiftly iterate and validate draft designs in light of user feedback. In doing so, by the end of our process, we could come to a useful and usable solution. Prior to initiating design work, we took a step back and conducted remote focus groups and 1:1 interviews to understand how coordinators across the country currently create multi-section courses. What does this process look like for them? Where do issues arise? How do Learning Management Systems come into play? This early research provided our cross-functional team with a deeper knowledge of users’ needs and goals. We used information gleaned from early research sessions to create a course coordinator persona. User goals were defined here, giving teams common language to talk about relevant problems — and how to best solve them. 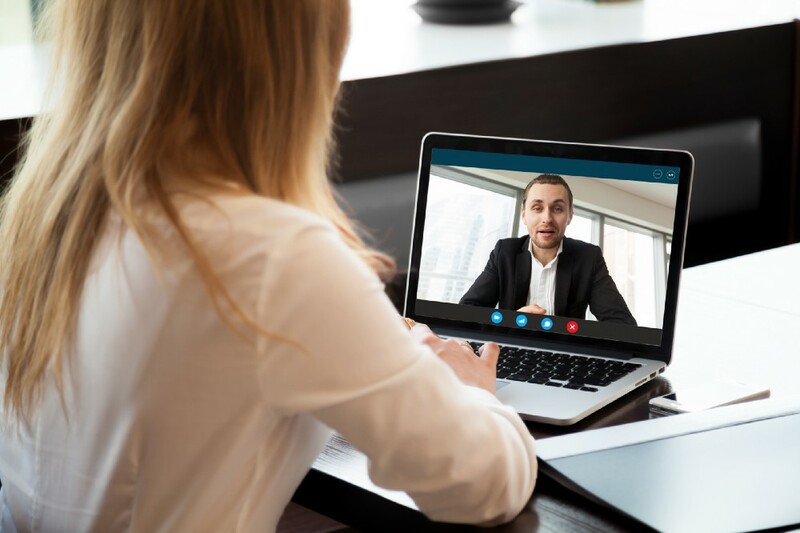 As the design team started building out a draft experience, UXR hosted 1:1 remote usability testing sessions with course coordinators (users and potential users) across the country. We screen-shared semi-functional draft designs, turned over control of the keyboard and mouse, and asked participants task-oriented and open-ended questions. Because stakeholders (design, product, engineering) were observing each session, we quickly identified design issues, iterated in-between sessions, and validated potential solutions with subsequent users. What are some things we learned in our multi-section course research? Well…A LOT! But, sometimes the most memorable findings are the ones that are those ‘aha’ moments — the ones where we watch users go through a potential workflow and an imaginary lightbulb goes off for us. We immediately consider an easier way for users to accomplish a task. Designs are revised and further validated. One example of an ‘aha’ moment within our research involved ‘auto-save’ during educators’ process of building out coursework. Auto-save seems harmless enough, right? But employing auto-save within the complex task of building out coursework for a multi-section course didn’t seem to give users enough confidence that their work was indeed being saved. Designs were revised and the issue was alleviated. Another compelling finding involved course Initialization links — what instructors would need to click within a workflow to make the course section ‘start.’ Early draft designs did not seem to make enough distinction between this link and additional content on the same screen. Again, designs were revised to more overtly highlight where users should navigate to initialize the course. 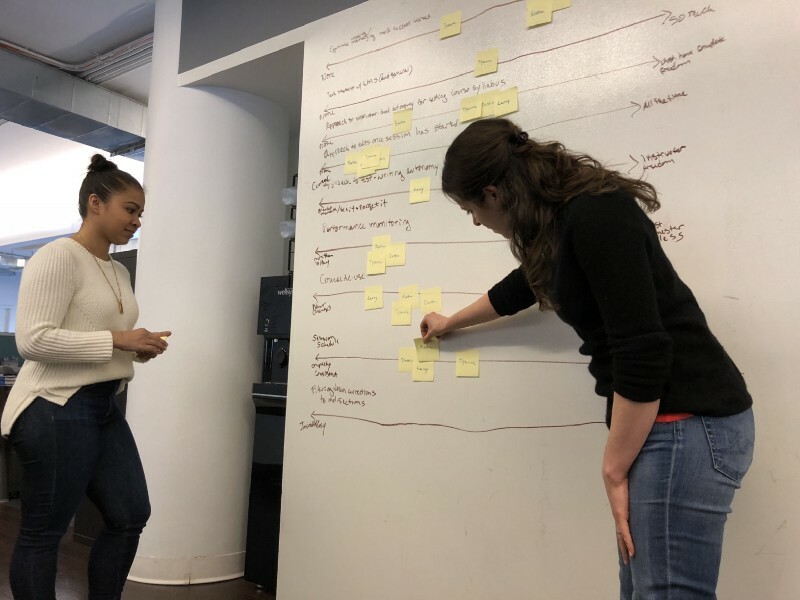 Using a multi-method research approach provided our cross-functional team with a solid understanding of user needs prior to any design work, and the flexibility to improve designs in-between research sessions. Upon concluding our design research, we came away away with an experience we’re confident is useful and usable, and can be put into development for our customers. Today, we’re excited to celebrate National Higher Education Day. What is #NationalHigherEducationDay, you ask? Let us tell you! Celebrated annually on June 6, it’s a day to champion the value of higher education — and to acknowledge all of the hard work that must be done to make sure everyone can share in it. This is more than just some extra spending money in your bank account. It’s the type of financial security that allows you to pursue a career in a field you’re passionate about or move forward with a Major Life Decision. To understand why, we’d like to use National Higher Education Day as cause to look at three of higher ed’s biggest challenges — and think about how we can work together to solve them. A college education provides students with a number of benefits. But sometimes it’s helpful to remember that students will only be able to realize these benefits if they complete their courses and go on to graduate. Unfortunately, fewer than 6 in 10 students who enter college go on to graduate.3 Fewer still will graduate on-time. As we see it, the biggest opportunity to improve on-time graduate rates is to help students who aren’t prepared for college — particularly in math — get up to speed quickly. It’s often said that education is our society’s great equalizer. But what if not everyone has the same access to higher education? 11% of undergraduate students — nearly 2 million in total — have diagnosed disabilities.7 These students are faced with a number of challenges, not the least of which is course materials that aren’t fully ADA compliant. This doesn’t include students who have undiagnosed disabilities in college, when students often have to self report that they are learning disabled. Improving the learning experience for students with disabilities is a complex issue. But if there’s one thing we can all agree on, it’s that course materials that are fully ADA compliant should become the norm. College provides an incredible value to students. But it’s still expensive. $1.5 trillion in total U.S. student debt.9 An average debt of more than $39K for the Class of 2017.10 These numbers can be so big that they almost seem to lose meaning. But for students, their impact is very real. We have a shared obligation to make college more affordable, without compromising outcomes or accessibility. We built alta, Knewton’s fully integrated adaptive learning courseware, with higher education’s biggest challenges in mind. Alta combines Knewton’s adaptive learning technology with high-quality openly available content to help students achieve mastery. Alta is accessible to all learners: its technology, content and user experience are all WCAG 2.0 AA-level ADA compliant. At $44 for 2-year access, it’s also affordable. Solving higher education’s biggest challenges won’t happen overnight, but if we are to reaffirm the value of college for all learners, we must never lose sight of them. What else needs to be done to improve higher education? What more can we be doing to help? Hit us up on social and tag your post with #NationalHigherEd day. How does Knewton’s Proficiency Model estimate student knowledge in alta? Accurately estimating a student’s knowledge is one of the core challenges of adaptive learning. By understanding what a student knows and doesn’t know, adaptive learning technology is able to deliver a learning experience that will help the student achieve mastery. Understanding the student knowledge state is also essential for delivering accurate, useful analytics to students and instructors. We refer to our data-driven mathematical model for estimating a student’s knowledge state as Knewton’s Proficiency Model. This model lies at the core of our ability to deliver lasting learning experiences to students using alta. The observed history of a student’s interactions, including which questions the student answered correctly and incorrectly, the instructional material they studied, and when they performed these activities. Content properties, such as the difficulty of a question the student is answering. The structure of the Knewton Knowledge Graph, in particular the prerequisite relationships between learning objectives. 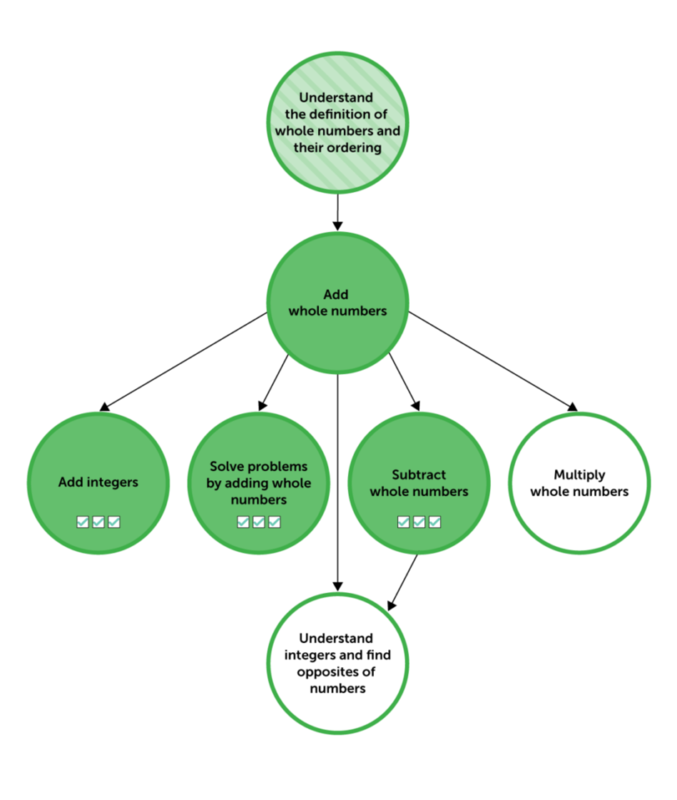 The model’s outputs represent the student’s proficiencies in all of the learning objectives in the Knowledge Graph at a given point in time. So what’s in between the inputs and the outputs? The foundation for our Proficiency Model is a well-known educational testing theory known as Item Response Theory (IRT). One important aspect of IRT is that it benefits from network effects — that is, we learn more about the content and the students interacting with it as more people use the system. When a student answers a difficult question correctly, the model’s estimated proficiency for that student should be higher than it would be if the student had correctly answered an easy question. But how can we determine each question’s difficulty level? Only by observing how large numbers of diverse students performed when responding to those questions. With this data in-hand, we are able to better and more efficiently infer student proficiency — or weakness — and deliver content that is targeted and effective. Because IRT was designed for adaptive testing — a learning environment in which a student’s knowledge remains fixed — it does not meet all of the requirements of adaptive learning, an environment in which the student’s knowledge is continually changing. In a model based on IRT, a student’s older responses make the same impact on the student’s proficiency level as their more recent responses. While this is fine in a testing environment, in which students aren’t typically provided feedback or instruction, it becomes a problem in an adaptive learning environment. In an adaptive learning environment, we inherently expect that students’ knowledge will change. As a result, we want to give more weight to recent responses than older ones — allowing for the possibility of an “Aha!” moment along the way. To correct for the limitations of IRT, Knewton has built temporal models that weight a student’s recent responses more heavily than their older ones when determining proficiency, providing a more accurate and dynamic picture of the student’s knowledge state. Adaptive learning requires constant, granular assessment on multiple learning objectives embedded in the learning experience. However, traditional IRT also does not account for the relationships between learning objectives. As discussed above, these relationships are an important part of the Knewton Knowledge Graph. To remedy this shortcoming of IRT, Knewton has developed a novel way to incorporate these relationships in a Bayesian modeling framework, allowing us to incorporate prior beliefs about proficiency on related topics, with evidence provided by the student’s responses. 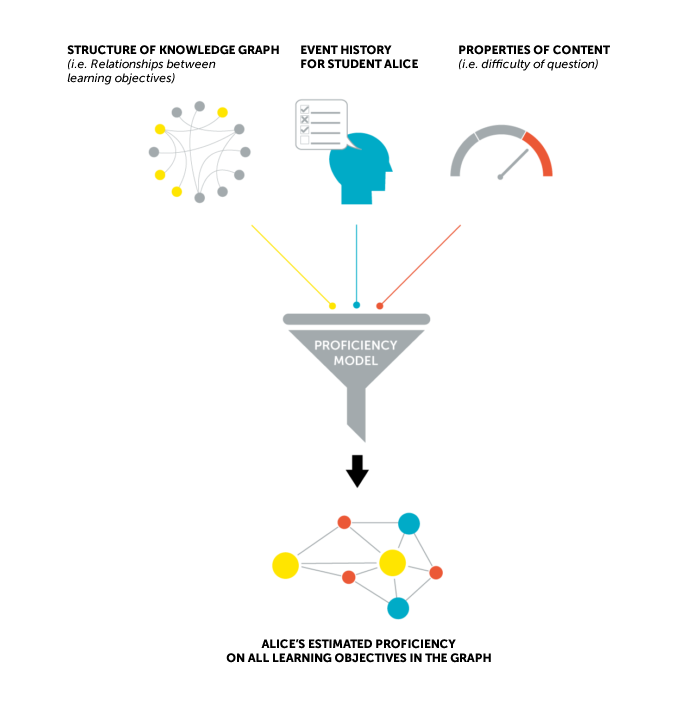 This leads to so-called proficiency propagation, or the flow of proficiency throughout the Knowledge Graph. 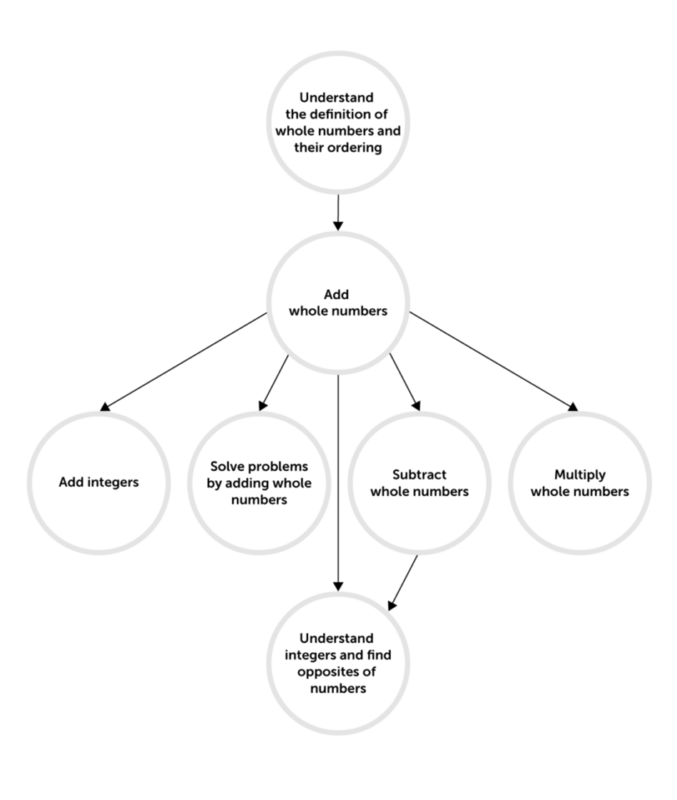 What does this look like in practice? 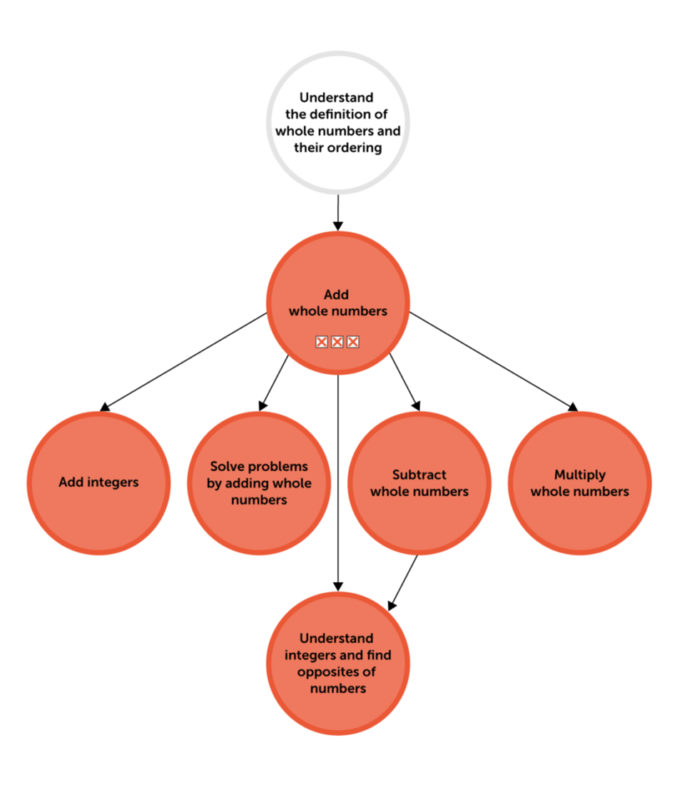 If, in the Knowledge Graph below, a student is making progress toward the learning objective of “Solve word problems by subtracting two-digit numbers,” our Proficiency Model infers a high proficiency on that learning objective. 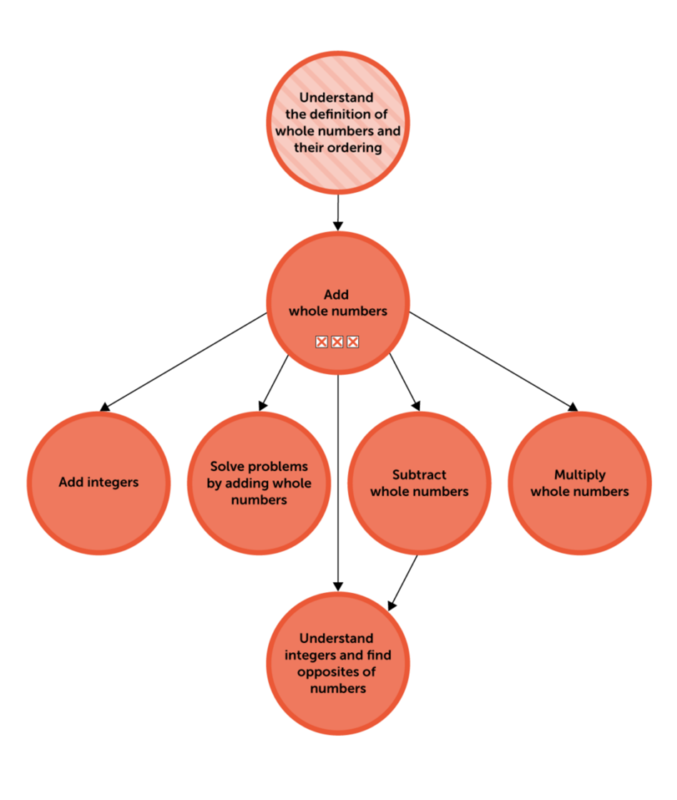 The model also infers a high proficiency on the related learning objectives (“Subtract two-digit numbers” and “Subtract one-digit numbers”), even without direct evidence. The basic idea: If two learning objectives are related and a student masters one of them, there’s a good chance the student has also mastered the others. The many facets of the Proficiency Model – IRT-based network effects, temporal effects, and the Knowledge Graph structure – combine to produce a highly accurate picture of a student’s knowledge state. We use this picture to provide content that will increase that student’s level of proficiency. It’s also the basis of the actionable analytics we provide to students and instructors. How effective is the Proficiency Model in helping students master learning objectives? In his post “Interpreting Knewton’s 2017 Student Mastery Results,” fellow Knerd Andrew D. Jones presents data that shows that Knewton’s Proficiency Model helps students achieve mastery — and that mastery, as determined by the Proficiency Model, makes a positive impact on student’s academic performance. This post was developed with Illya Bomash, Knewton’s Managing Data Scientist. Student success is the ultimate goal of learning technology. Despite this, there exists a startling lack of credible data available to instructors and administrators that speaks to the impact of ed-tech on learning and academic performance. To provide instructors and administrators with greater transparency into the effectiveness of alta and the Knewton adaptive technology that powers it, we analyzed the platform results of students using alta. These results represent our effort to validate our measure of mastery (more on that to come) and provide instructors and administrators with much-needed transparency regarding the impact of alta on student achievement. Here, we hope to provide context and explanation that we hope will leave educators and those in the ed-tech community with a clearer picture of how we arrived at the these results — and why they matter. The findings in this report are drawn from the results of 11,586 students who cumulatively completed more than 130,000 assignments and 17,000 quizzes in alta in 2017. This data set includes all of alta’s 2017 spring and summer student interactions. Only cases in which the relevant calculations are impossible have been excluded — such as quiz scores for a course in which the instructor chose not to administer quizzes. So while these results aren’t from randomized, controlled trials, they do paint an accurate portrait of student performance across alta users, making use of as much of our student data as possible. Our adaptive technology is based on the premise that if a student masters the concepts tied to the learning objectives of their course, that student will succeed in the course and be prepared to succeed in future courses. It’s also based on the premise that Knewton’s mathematical model of student knowledge states — which we frequently refer to as Knewton’s proficiency model — can determine when a student has reached mastery. This basis in mastery manifests itself in how students experience alta: Every assignment that a student encounters in alta is tied to learning objectives that have been selected by the instructor for their course. A student “completes” an alta assignment when our proficiency model calculates that a student has mastered all of the learning objectives covered in that assignment. Our 2017 Mastery Results seek to clarify two things: the frequency with which students achieve mastery in alta, and the later performance of students who have (and have not) achieved mastery, as determined by our proficiency model. In this analysis, we wanted to assess the impact of mastery across the full spectrum of student ability levels. To capture a sense of each student’s initial proficiency, we aggregated the first two questions each student answered across all of the concepts he or she encountered in the course. The percentage of those questions the student answered correctly provides a naive but reasonable estimate of how well the student knew the material entering the course. We looked at the distribution of this score across all of our students, tagging each student’s history with a label corresponding to where they fell among all users. Note: Knewton’s proficiency model neither uses this measure nor tags students with any kind of “ability label.” Our adaptive technology calculates a detailed, individualized portrait of each student’s proficiency levels across a wide range of concepts after each student interaction. But for the sake of this comparative impact analysis, we’ve chosen to use these distinctions as a tool to compare students of similar initial abilities. Analyzing students’ assignment completion revealed that with alta, students achieve mastery at high rates. As seen in Figure 1, across all students, 87% of the time, students working on an assignment in alta achieved mastery. Even among students who struggled to complete a particular assignment, 82% eventually reached mastery. We know that with alta, students are highly likely to achieve mastery. But what is the impact of that mastery? When our model indicates that a student has mastered the material, how well does the student perform on future assignments, quizzes, and tests? For any given level of initial ability, Knewton’s adaptive learning technology is designed to facilitate reaching mastery effectively for any student willing to put in the time and effort. To validate Knewton’s measure of mastery, we compared the performance of students who mastered prerequisite learning objectives (for adaptive assignments) and target learning objectives (for quizzes) through altawith students of similar initial ability who did not master these concepts. Figure 2 shows average Knewton quiz scores for students who did/did not reach mastery of the quiz learning objectives on prior adaptive assignments. Quiz takers who mastered at least ¾ of the quiz learning objectives through previous adaptive work went on to achieve substantially higher quiz scores than similarly-skilled peers mastering ¼ or fewer of the learning objectives. Putting in the work to reach mastery on the relevant adaptive assignments increased initially struggling students’ average quiz scores by 38 percentage points, boosting scores for these students above the scores of otherwise advanced students who skipped the adaptive work. Students who master the learning objectives on earlier assignments also tend to perform better on later, more advanced assignments. As Figure 3 shows, controlling for overall student skill levels, students who mastered ¾ of the learning objectives prerequisite to any given assignment tended to complete the assignment at much higher rates than students who did not. This is the virtuous cycle of mastery: the more students master, the better prepared they are for future learning. Mastery of an assignment’s learning objectives also saves students time. When students began an assignment after having mastered most of its prerequisites, they tended to require significantly fewer questions to complete it. For students who mastered at least ¾ of the prerequisites to any given adaptive assignment, completing the assignment took 30-45% fewer questions than for students who did not (see Figure 3). Mastery helps students of all abilities learn faster, and struggling students see the biggest gains: for these students, prerequisite mastery leads to an average postrequisite assignment shortening by more than 40%. Any self-reported efficacy results will be met with a certain amount of scrutiny. While we’ve attempted to be as transparent as we can be about our data, we understand that some will question the validity of our data or our approach to presenting it. It’s our hope that, if nothing else, the reporting of our results will inspire others in the ed-tech community to present their own with the same spirit of transparency. In many ways, these results are intended not as a definitive end-point but as the start of a more productive conversation about the impact of technology on learning outcomes. Lastly, while our 2017 Student Mastery Results are encouraging, we know that they exist in a world that is constantly changing. The challenges in higher education are becoming greater and more complex. The student population is growing increasingly diverse. Our technology and our approach to learning is evolving. This year, we plan to update these numbers periodically and provide the results of other analyses with the goal of providing greater transparency into the effectiveness of alta and deeper insights into how students learn. Your student looks at the problem and looks back at you, terrified. He has no idea what to do. Clearly he hasn’t yet mastered the ability to solve word problems with two-digit subtraction. But what exactly is the problem? Is he struggling with the word problem itself, or is he missing crucial prerequisite knowledge as well? Translate a word problem about subtraction into a mathematical expression: Question text → 32–15 = ? 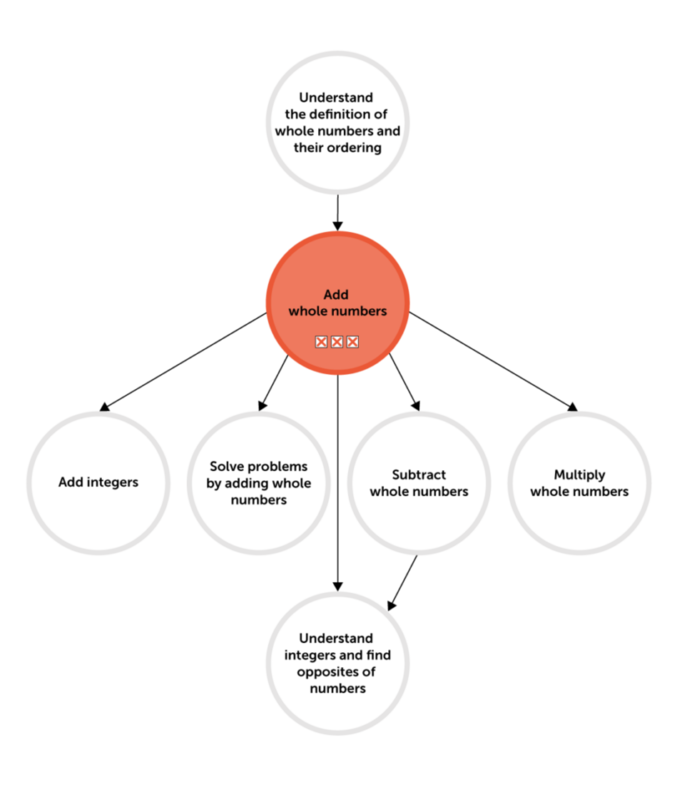 In the picture above, we are representing each learning objective as an oval. An arrow pointing from oval A to oval B indicates that a student must know A in order to be successful in B — we describe this relationship by saying that “A is a prerequisite to B”. 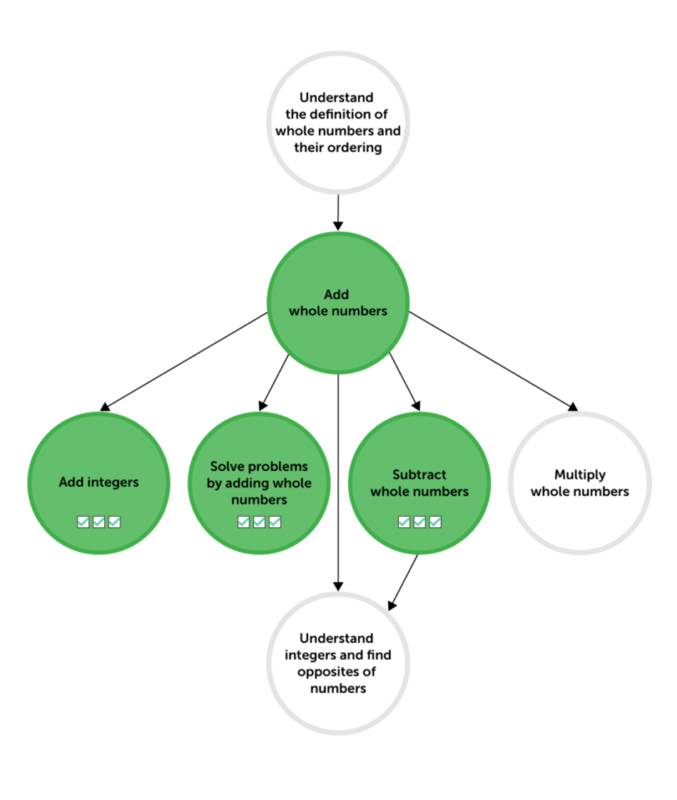 This simple framework forms the foundation of Knewton’s Knowledge Graphs, a key tool that helps Knewton provide adaptive assignments and analytics in alta. The tiny Knowledge Graph above is a very simple example of how relationships between learning objectives can be represented. In many cases, a given learning objective can have multiple direct prerequisites. A simple example of a learning objective with two prerequisites can be found by looking at the learning objective requiring students to divide fractions. To divide fraction X by fraction Y, you multiply X times the reciprocal of Y. This means that in order to be able to divide fractions, you must already be able to (1) multiply fractionsand (2) find reciprocals of fractions. By connecting each learning objective to its prerequisites, we can create a large Knowledge Graph full of connections between our content. Learning objectives can be connected to each other even if they appear in different assignments, chapters, or courses. Below, we show an example section of a large Knowledge Graph, where different colored learning objectives can be thought of as different assignments, chapters, or course levels. 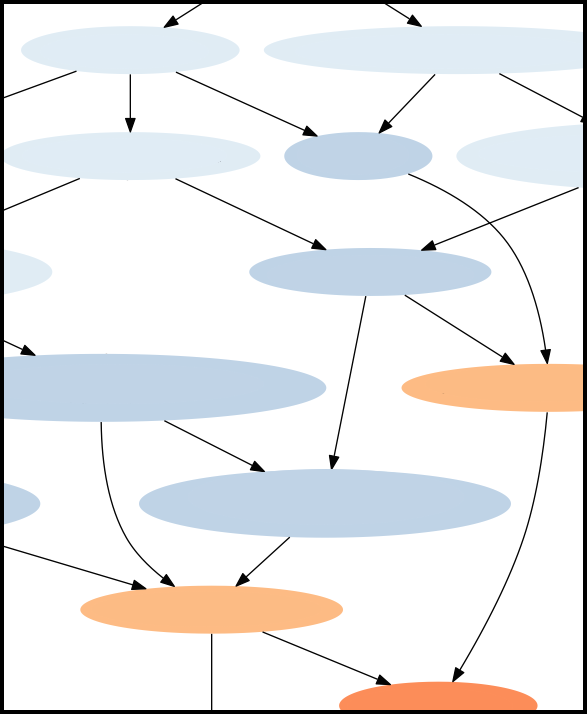 The notion of representing content relationships in a graph structure is not new, and Knewton’s Knowledge Graphs build on previous work (Novak 1990; McAleese 1999; Doignon and Falmagne 1999; Hwang 2003). Knewton’s Knowledge Graphs are created by trained subject matter experts, who identify the learning objectives in a course, the relationships between these learning objectives, and the pieces of content that teach and assess each learning objective. This direct alignment of each piece of content to learning objectives allows Knewton to precisely diagnose which learning objectives a student has mastered, in addition to providing targeted instructional content when a student is struggling. Knewton’s Knowledge Graphs allow us to generate adaptive recommendations based on pedagogical criteria, such as those reviewed by Graesser et al. (2012), including frontier learning, building on prerequisites, and providing remediation. For example, let’s go back to our struggling student. 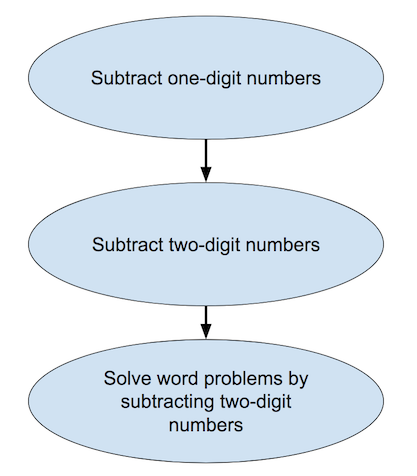 It is possible that our student may not have the prerequisite knowledge necessary to succeed in solving word problems with two-digit subtraction. If he struggles when solving these word problems in an alta adaptive assignment, Knewton’s recommendation engine can diagnose his prerequisite knowledge by using the information contained in the Knowledge Graph and provide just-in-time remediation in the form of targeted instructional content and formative assessment on the prerequisite learning objective(s) that he is struggling with. 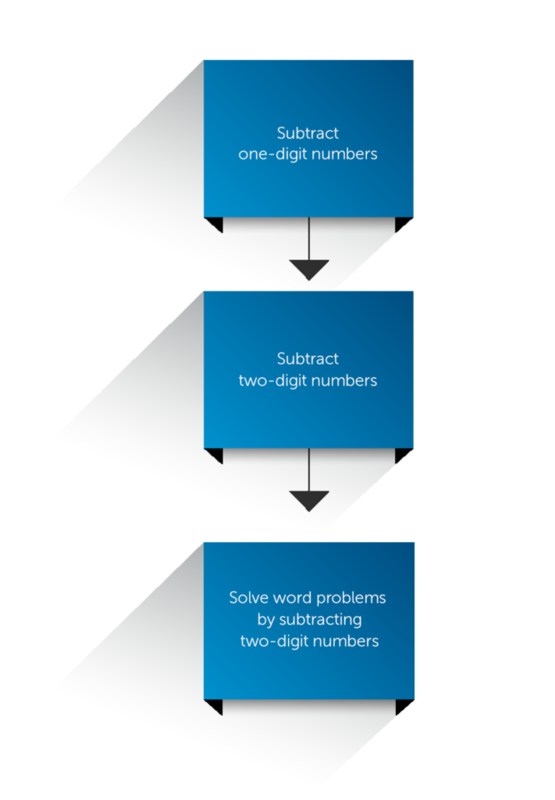 As the student masters the prerequisites, Knewton can move him forward towards his ultimate goal of learning how to solve word problems with two-digit subtraction. Since Knewton’s Knowledge Graphs are an abstract representation of relationships between learning objectives, prerequisite relationships can also be defined between learning objectives existing in different books, subject areas, or school years, enabling cross-domain adaptivity. For example, Knewton can recommend remediation on a math prerequisite that’s required for mastering a chemistry learning objective. As we’ll see in a future blog post, Knewton’s Knowledge Graphs are also a key input in the Knewton predictive analytics engine, enabling Knewton to estimate student mastery on each learning objective in a graph. Doignon, J. P. and Falmagne, J. C. (1999). Knowledge Spaces. Springer. Graesser, A. C., Conley, M. W., and Olney, A. (2012). Intelligent Tutoring Systems. APA Handbook of Educational Psychology. Washington, DC: American Psychological Association. Hwang, G.-J. (2003). A Conceptual Map Model for Developing Intelligent Tutoring Systems. Computers & Education, 40(3):217–235. For decades, educators and policymakers have been looking for ways to to remedy the epidemic of incoming freshman who require extra preparation for college level coursework yet end up languishing in courses that don’t earn them college credit. The number of students placed into non-credit bearing “prerequisite” courses who fail to ever enter — let alone pass — a credit-bearing course is staggering. Ninety-six percent of colleges enrolled students who required remediation during the 2014-2015 academic year, and more than 200 schools placed more than half of their incoming students into at least one remedial course. But less than one in four students in remediation at 2-year colleges ever make it to a credit-bearing course. This comes at a cost to taxpayers of $7 billion annually. To address this challenge, colleges and universities have increasingly turned to “redesign,” a shorthand term for the process by which they reconceive instruction for an entire course area to improve student outcomes and cut down on costs for students. There are many configurations of redesign. While all have led to some level of student gains, the corequisite model has produced results that merit closer attention. The corequisite model dispenses with prerequisite courses and replaces them with college-level courses that include “just-in-time” support for students who require it. By providing extra support within the framework of a college-level course, the corequisite model promises to accelerate students’ progress and increases their chances of success. In Georgia, a state that had used a traditional, prerequisite model, only 21% of developmental-level students went on to complete the related, college-level math course. After transitioning to corequisites, that number leapt to 64%. The results were even more dramatic in Tennessee, where the number of students requiring remediation in math who went on to complete a credit-bearing course exploded, going from 12% to 63%. More states are dipping their toes into corequisite waters. This past June, Texas Governor Greg Abbott mandated that the state’s public colleges and universities must enroll 75% of their developmental-level students in a corequisite course by 2020. In the parlance of the tech community, that’s a big lift. For states and institutions seeking to give students who require extra support the skills they need while keeping them on pace to earn their degree on time, the corequisite model of redesign shows promise. But still, corequisites present a challenge: providing personalized instruction to students whose skill levels may vary greatly at the start of the course. Looking to power their corequisite redesign efforts with adaptive technology, colleges are making Knewton a key part of their corequisite courses. Knewton, which provides all students with an adaptive, personalized path to mastery and offers “just in time” support when needed, is a perfect fit for corequisite courses, which must achieve dual goals: providing developmental-level students with prerequisite skills while helping all students achieve the learning objectives of a college-level course. 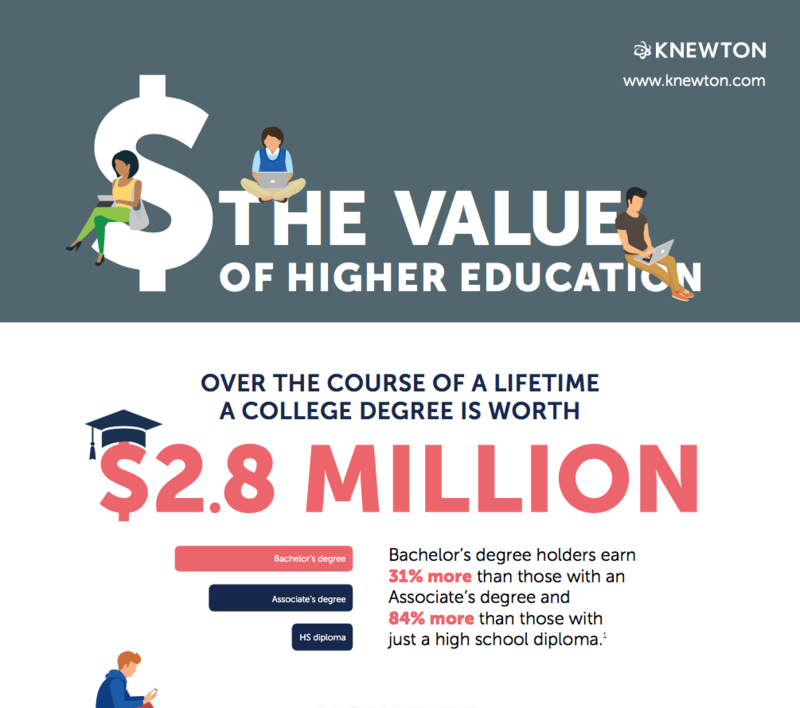 And at $44 for two years of access, Knewton’s alta is in line with one of the goals of corequisites: making college more affordable. While Knewton fits perfectly within any college-level course that includes both well-prepared and underprepared students, we’ve created corequisite versions of some courses to reflect their unique structure, which varies based on approach. Our corequisite courses support a blended approach with “just in time” support, a targeted approach with developmental math review available to be assigned at the beginning of every chapter, and a compressed approach that includes four weeks of developmental math and 8 weeks of college-level material. New approaches to redesign and corequisites are constantly emerging. Because of how our content and technology is built, we’re ready to help institutions and instructors seize opportunities to help students succeed by quickly designing solutions that meet their needs. We’re excited by Knewton’s ability to support the corequisite model of redesign and to bring you the results of Knewton implementations in corequisite courses. In the meantime, we’ll be working hard to put achievement in reach for all learners by making more corequisite courses available. What does knowing something tell us about a related concept? At Knewton, we’ve built an adaptive learning platform that powers digital education around the world based on cutting-edge algorithms that leverage the diverse datasets we receive. One of the core data-driven models that powers everything we do is our Proficiency Model, which we use to infer each student’s knowledge state. We do this by combining a “knowledge graph”, time-tested psychometric models, and additional pedagogically motivated modeling. We’ll show you how the relationships in the knowledge graph get realized in Knewton’s Proficiency Model and answer the question: “What does knowing something tell us about knowing a related concept?” This has important pedagogical consequences, as well as an enormous impact on how our recommendations get served (and how confident we can be in their accuracy!). In math-speak this is a directed acyclic graph (DAG). We already covered what the “graph” part means. The “directed” part just means that the edges are directed, so that “A prerequisite to B” does not mean “B prerequisite to A” (we instead say “B postrequisite to A”). This is in contrast to undirected edges in social networks where, for example, “A is friends with B” does imply “B is friends with A”. The “acyclic” part of DAG means there are no cycles. A simple cycle would involve A → B → C → A. This would imply that you need to know A to know B, B to know C, and then C to know A! This is a horrible catch-22. You can never break the cycle and learn these concepts! Disallowing cycles in the graph allows us to represent a course, without contradictions, as starting with more basic concepts, and leading to more advanced concepts as the student progresses (this progression is top-to-bottom in the graph above). Another crucial aspect of the knowledge graph is the content: i.e. the assessing questions and the instructional material. Each concept has a number of such content pieces attached, though we don’t show them in the picture above. You can think of them as living inside the node. How do we know what you know? Abstractly, proficiency on a concept refers to the ability for a student to perform tasks (such as answer questions correctly) related to that concept. Thus, we can use the estimated values of the proficiencies to predict whether the student answers future questions correctly or not. Comparing our predictions to reality provides valuable feedback that allows us to constantly update and improve our model and assumptions. The foundation for our Proficiency Model is a well-tested educational testing theory known as Item Response Theory (IRT). One important aspect of IRT is that it accounts for network effects— we learn more about the content and the students as more people use the system, leading to better and better student outcomes. IRT also serves as a foundation for our Proficiency Model on which we can build additional features. One thing that basic IRT does not include is any notion of temporality. Thus older responses count the same as newer responses. This is fine in a testing environment, where “older” responses mean “generated 20 minutes ago”, but isn’t great in a learning environment. In a learning environment, we (obviously) expect that students will be learning, so we don’t want to overly penalize them for older work when in fact they may have had an “Aha!” moment. To remedy this, we’ve built temporal models into IRT that make more recent responses count more towards your proficiency estimate than older responses on a concept*. Another thing that basic IRT does not account for is instructional effects. Consider the following example. Alice got 2 questions wrong, watched an informative video on the subject, and then got one question right. Under basic IRT we’d infer that her proficiency was the same as Bob who got the same 2 question wrong, did not watch the video, and then got one question correct. This doesn’t seem accurate. We should take Alice’s instructional interaction into account when inferring her knowledge state and deciding what’s best for her to work on next. We have extended IRT to take into account instructional effects. Finally, basic IRT does not account for multiple concepts, nor their interrelationships in the knowledge graph. This will be the main focus of the rest of this post. The titular question of this post: “What does knowing something tell us about knowing a related concept?” is answered through Proficiency Propagation. This refers to how proficiency flows (propagates) to different concepts in the knowledge graph. 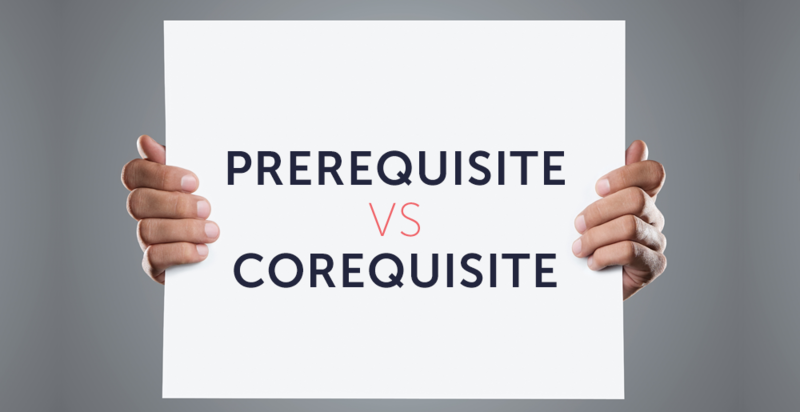 To motivate why proficiency propagation is important, let’s consider two different scenarios. First, consider the example shown below, where the only activity we’ve observed from Alice is that she performed well (a ✔ indicates a correct response) on several more advanced concepts. In our case, there are three different “concept B’s” that Alice has clearly mastered. Thus, by definition of the prerequisite relationship Alice almost certainly has mastered “Add whole numbers” (it’s the concept A). So let’s paint that green, indicating likely mastery. Mastery (i.e. correct responses) propagates strongly ‘backwards’ to prerequisites. As we get further from direct evidence in the prerequisite chain, there is more uncertainty. Thus we infer slightly less mastery. Mastery propagates weakly ‘forwards’ to postrequisites. Thus, we now know that struggling-ness propagates strongly down to the postrequisites of “Add whole numbers”! Struggling (i.e. incorrect responses) propagates strongly forwards to postrequisites. Struggling propagates weakly backwards to prerequisites. Notice these rules are just the mirror-opposites of the ones for propagating mastery! And all of this comes simply from the definition of “prerequisite-ness”, and some pedagogical reasoning. Convexity: This essentially means that the proficiencies are efficiently and reliably computable. Strong propagation of mastery up to prerequisites, and of struggling-ness down to postrequisites, with a slight decay in propagation strength at each ‘hop’ in the graph. Weak propagation of mastery down to postrequisites, and of struggling-ness up to prerequisites, with a large decay in propagation strength at each ‘hop’ in the graph. The above two points imply asymmetric propagation: The impact of a response on neighboring proficiencies is asymmetric, always being stronger in one direction in the graph than the other. All of this proficiency propagation stuff must also play nicely with the aforementioned IRT model and the extensions to include temporality and instructional effects. Coming up with a well-defined mathematical model encoding asymmetric strong propagation is a challenging and fun problem. Come work at Knewton if you want to learn more details! ! So what good exactly does having this fancy proficiency model do us? At the end of the day, students care about being served a good educational experience (and ultimately, progressing forward through their schooling), and in Knewton-land that inevitably means getting served good recommendations. Certainly, having a pedagogically-sound and accurate proficiency model does not automatically lead to good recommendations. But having a bad proficiency model almost certainly will lead to bad recommendations. A good proficiency model is necessary, but not sufficient for good recommendations. What are useful concepts to work on next? Has the student mastered the goal material? How much instructional gain will this material yield for the student? How much will this piece of material improve our understanding of the student’s knowledge state and therefore what she should focus on next? At the end of the day, it’s user experience stories like this that motivate much of the complex data analysis and mathematical modeling we do at Knewton. And it’s what motivates us to keep pushing the limit on how we can best improve student learning outcomes. *There are other temporal effects that kick-in if you’ve seen the same question more than once recently. ** There is a whole other layer of complexity in our Proficiency Model that we’ve glossed over. We actually estimate a student’s proficiency and a measure of our confidence in that estimate. These are the proficiency mean and variance, and can be combined to obtain confidence intervals, for example. For the purposes of this blog post, we are only considering the propagation of proficiency means. This post was written by Michael Binger, a data scientist at Knewton.